If you want to stay informed of St. Louis event schedules, subscribe to the Arch City Homes weekly email so you don’t miss any posts! 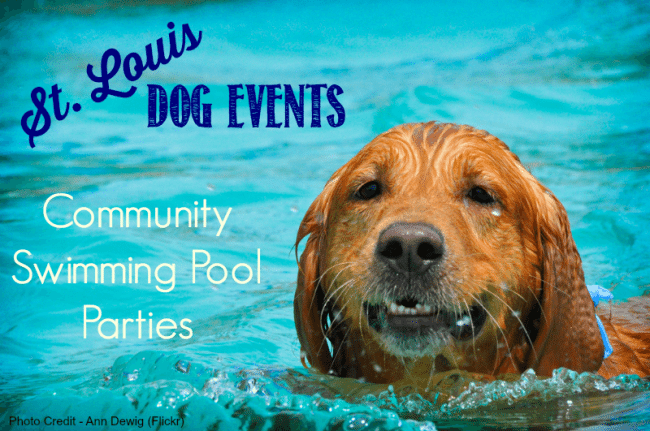 Many of the St. Louis community public swimming pools offer an end of summer dog swim party. Rules vary from pool to pool. Some pools don’t allow humans in the pools at all. Others allow people to wade into the pool with their dog. Some allow children, some don’t. Be sure to check the information provided before you head out so you know what to expect. All of the pools are going to require written proof that the dogs attending have had their shots and will expect you to clean up after your dog, so bring a shots record and your potty bags. 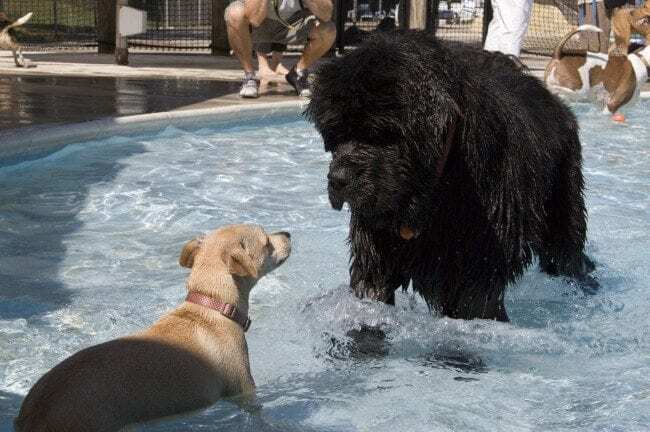 I took my dog Milo to the Kirkwood dog pool party a few years ago. 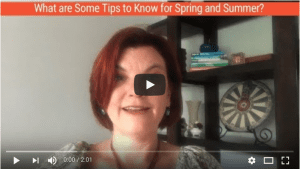 Check out the video I took to get a preview of what you can expect at these events. People can get into water knee deep only. Payment by cash or check. 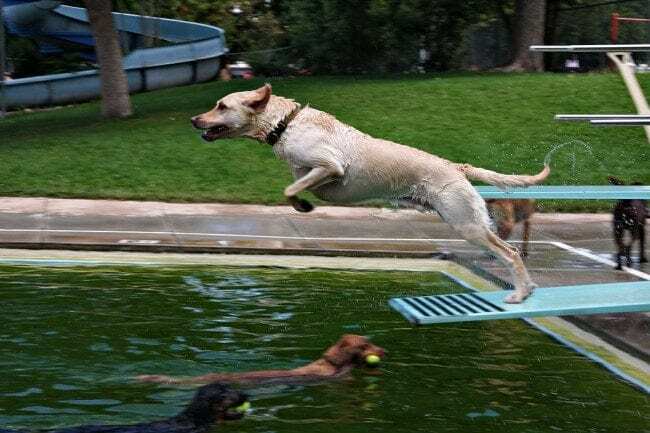 Multiple pools for the dogs to swim in and a lot of space to run. All dogs and children must be accompanied by an adult at least 18 years old. People are not allowed in the water. No aggressive dogs will be allowed. All dogs must have current vaccinations. Dogs must have proof of rabies and DHLPC2 vaccination. Owners must have the most recent record of vaccinations for dogs to participate. Up to 2 dogs per family and no puppies under 4 months old. In prior years, preregistration has been required. Contact Crestwood to see if it is required this year. All dogs who are friendly are welcome. Proof of rabies vaccinations and current tags are required. Owners must show written proof of current vaccinations for distemper, parvo and rabies. Owners may not swim with their dogs. Handlers must bring a copy of current rabies vaccination record for each dog. Handlers must be at least 18 years old and must sign waiver of liability. Dogs must be at least 6 months old. Limit 2 dogs per owner. Proof of rabies and DHLPP vaccinations required for admission. Proof of updated vaccinations (DHLPP and rabies) required before entering the pool. Proof of rabies and DHLPP vaccinations. All dogs must wear an ID tag and be on a leash unless swimming. 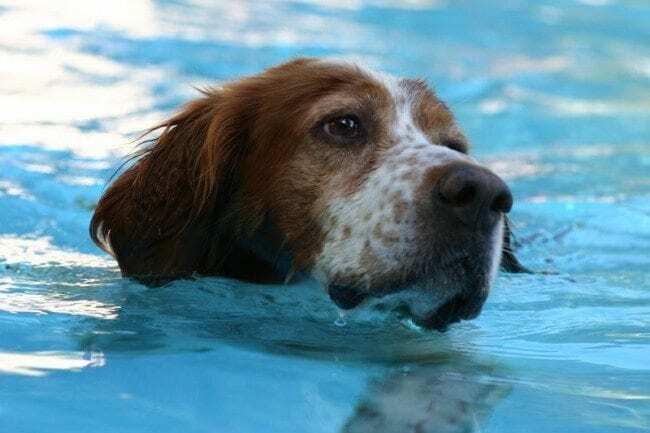 All current vaccination records, including DHLPP or DHLP and Rabies shots are required to swim. These must be written records. Tags are not proof. Maximum of 2 dogs per person. All dogs must be up to date on vaccinations (DHLPP and rabies). Bring written proof from the veterinarian, tags are not proof. All dogs must be recently bathed, wear an ID tag and be on a leash except when swimming. Owners must provide complete vaccination records (rabies, bordetella and distemper). Dangerous dogs must be muzzled. 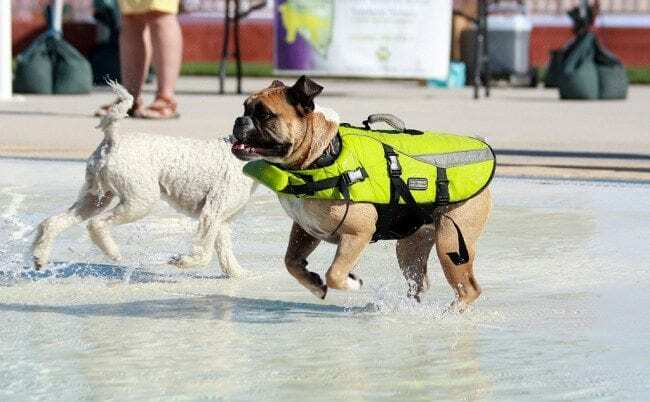 The swim is for Greater St. Louis area dogs more than four months of age. Rabies vaccination records are required for each dog to participate and must be presented at the front desk. Participants must sign a liability waiver. No children under 13 allowed. Children ages 13 to 18 must be accompanied by a parent or guardian over 18. No more than two dogs per person. Wading to the knees is permitted. No human swimming. Kiddie pool will be open for small dogs. 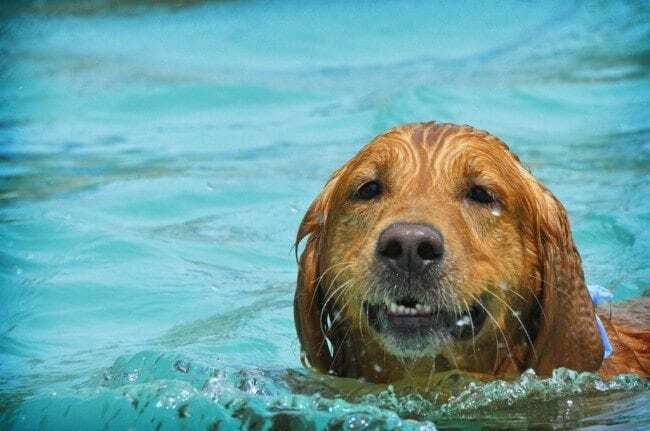 Dogs must be recently bathed and kept on a leash when not swimming. All dogs must be wearing an ID tag and a current Dogport tag or bring a current vaccination records including rabies and distemper. All dogs must be at least 6 months old. Limit of 2 dogs per person. An adult must accompany children under 18. To avoid entrance lines, pre-register at the Maryland Heights Center. Preregistration is available by calling 636-474-2732. Proof of rabies and DHLPP vaccinations. Dogs must be accompanied by an adult 18 or over. Dogs must have current shots records. 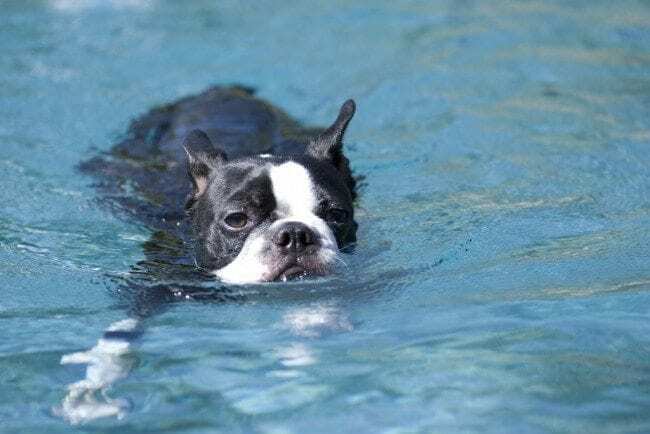 All current vaccination records, including DHLPP and rabies are required to swim. Well socialized dogs welcome. AGGRESSIVE dogs will be asked to leave. No pinch/choke collars! Owners MUST bring bags or other method to clean up after their dogs. 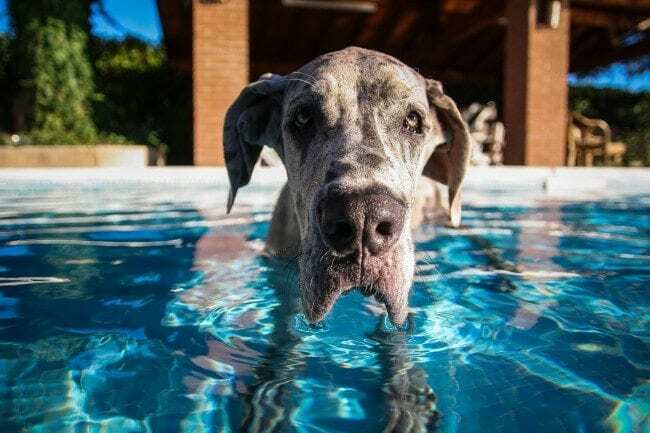 Dogs MUST be leashed unless swimming in the pool and closely supervised by their owners. All children under 18 MUST be accompanied by an adult. Dogs are running loose and become rambunctious. Small children should be closely supervised to avoid injuries. All owners MUST sign a waiver and are legally responsible for their dogs and any injuries or damage caused by their dogs. All dogs must wear an I.D. tag. Bring proof of vaccination (rabies and bordetella). Limit 2 dogs per handler, must be 18 years or older. Space is limited so pre-registration is encouraged. Dogs must be with an owner at least 18 yrs of age and owners must bring written proof that their dog’s rabies shot is current or be wearing a U City Dog Park tag. Belly flop contest at 1 pm both days and swimwear contest throughout both days. Water for the dogs and potty bags provided. Concession stand open selling bottled water, soda, hot dogs and popcorn. Owners must provide proof of vaccination records. Owners may wade but not swim with the dogs. Children 12 and under will not be allowed in the water. Bring proof of vaccination at time of registration. 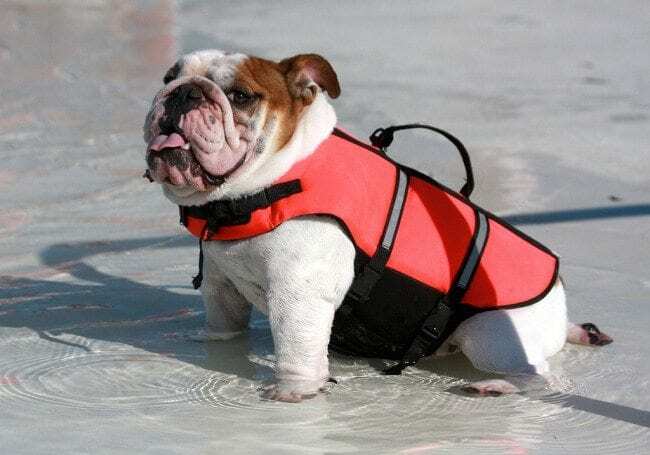 All dogs must be leashed when out of the water. Did I miss an event? If I did, leave me a comment below with the basic information and I’ll get it added to the list. 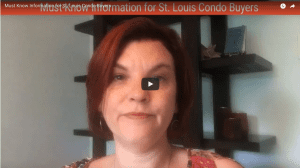 If you are a pet owner and want a pet-friendly realtor in St. Louis, we should talk. 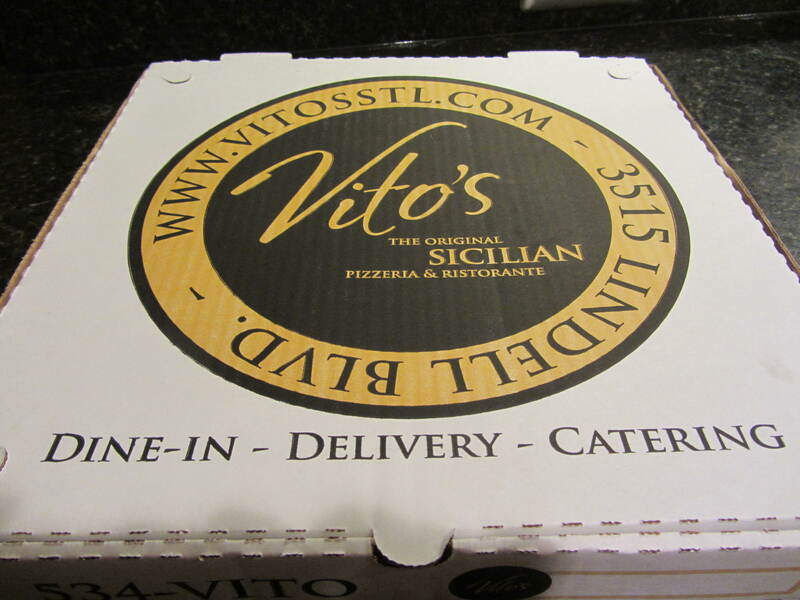 As I continue my Exploring St. Louis One Meal at a Time series, today I’m sharing one of my all time favorite pizza places, Vito’s Sicilian Pizzeria & Ristorante in Midtown. If you want to stay informed of St. Louis information, subscribe to the Arch City Homes weekly email so you don’t miss any posts! 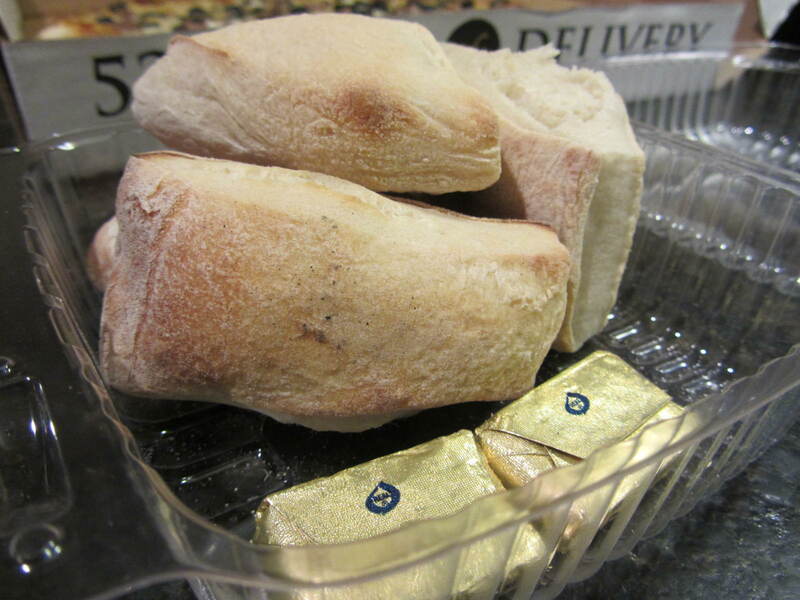 I have been eating at Vito’s ever since I discovered they delivered to my CWE condo. I’ve moved away from their delivery area, and miss it every time decide I want a pizza delivered to my home. I love the Italian sausage pizza, but I think my favorite ingredient is the portobello mushrooms. 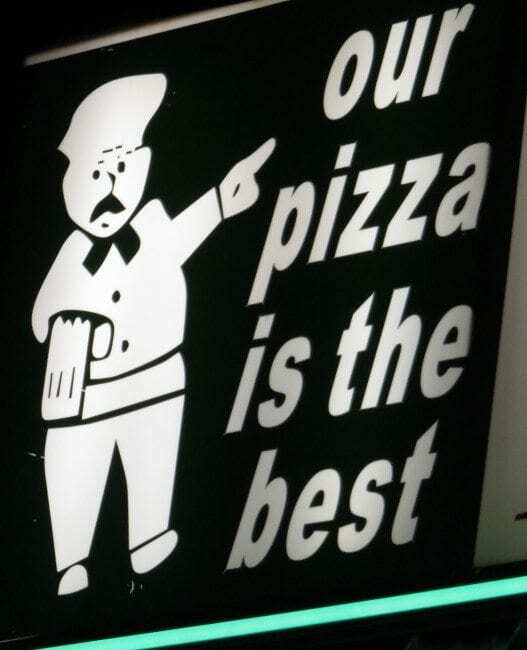 I’m not sure exactly what they saute the mushrooms in before they go onto the pizza, but it makes them taste amazing. 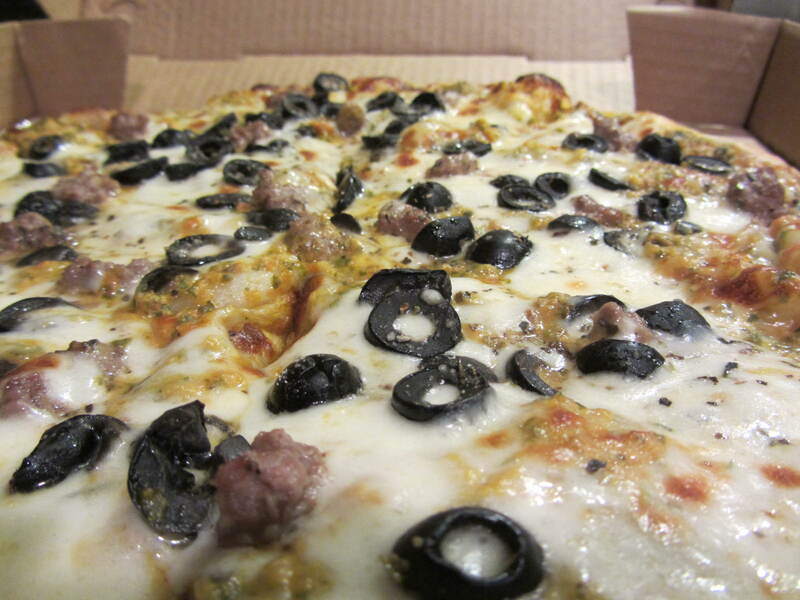 I’m also a fan of pesto sauce instead of marinara….you can see the green pesto at the edges if you look closely. Seriously, who doesn’t like basil! 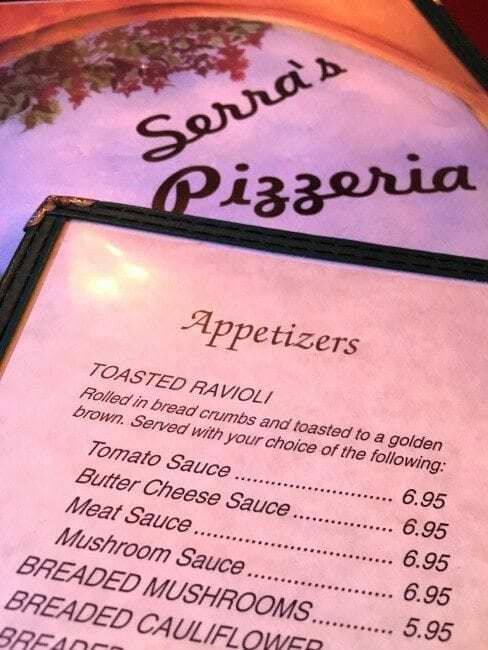 Your meal also comes with these fabulous rolls…probably made from the same dough as the pizzas. 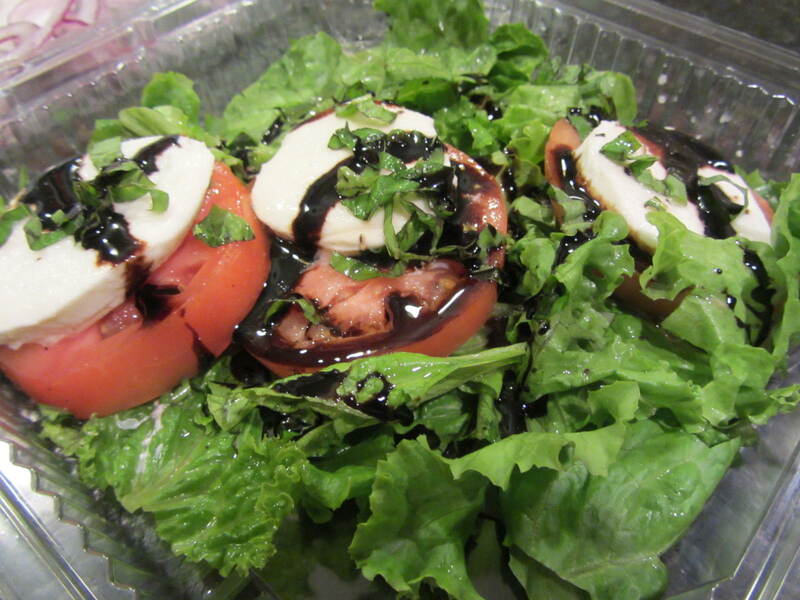 And you really can’t go wrong with the caprese salad. 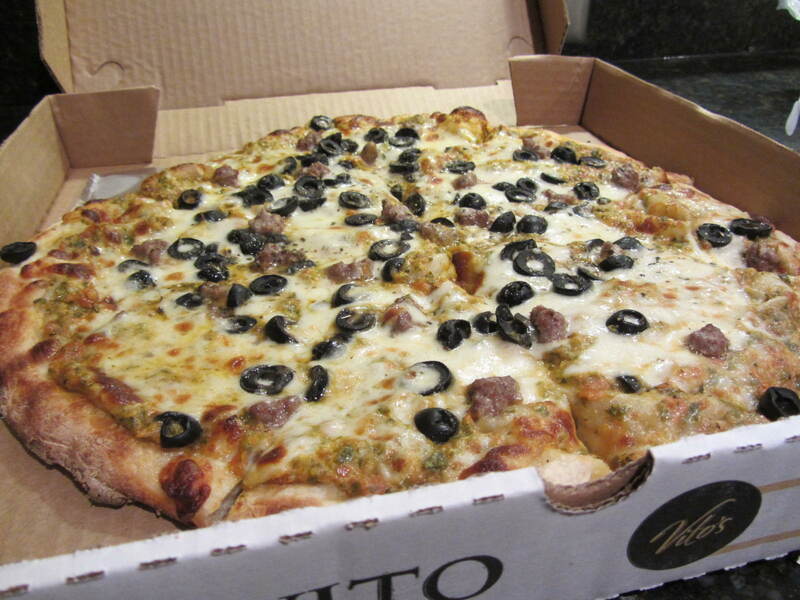 Vito’s is also a family owned business. My favorite kind of place. 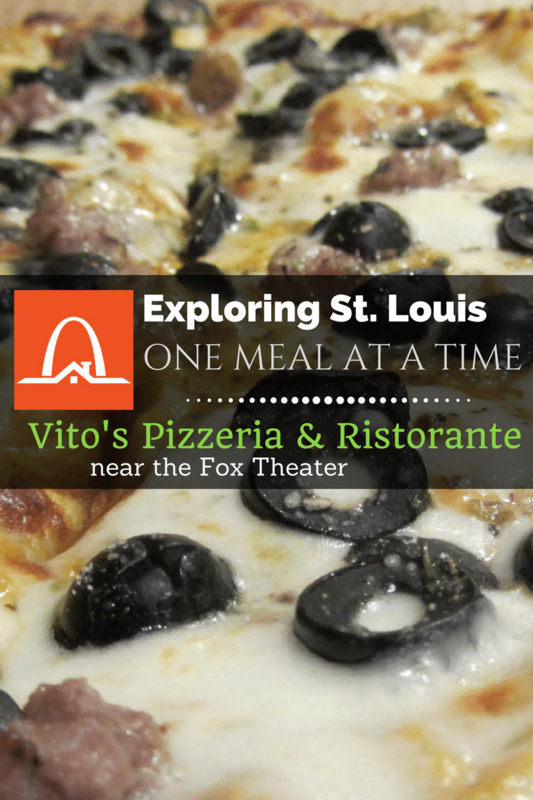 Vito’s is located just east of the popular Central West End district 1 block from the Fox Theater. 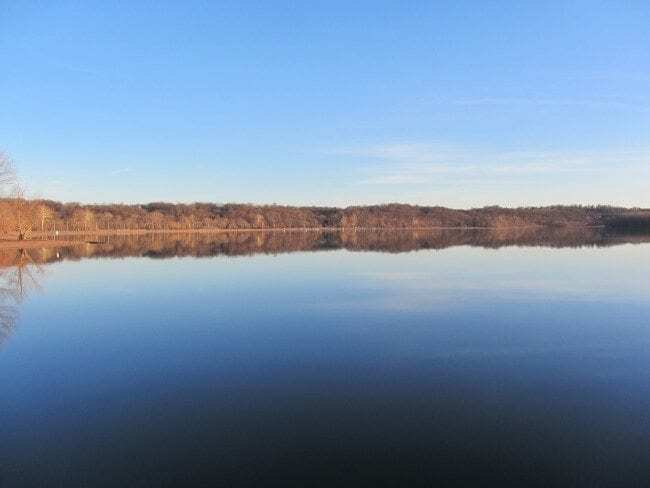 It’s a great place to live. The neighborhood is filled with restaurants, shops and recreation. It includes stops to the MetroLink train that can take you downtown to a ball came, or can get you to the airport without the need for an Uber ride. It’s also home to IKEA, Cortex and the BJC medical center. With 74% of homes rented, 39% of adults with graduate degrees and 93% of the households without children, there has been a steady demand for home purchases by buyers and investors in the CWE for years. 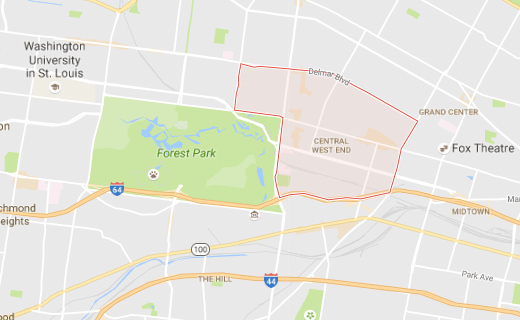 There are a wide range of home prices in the Central West End in St. Louis. 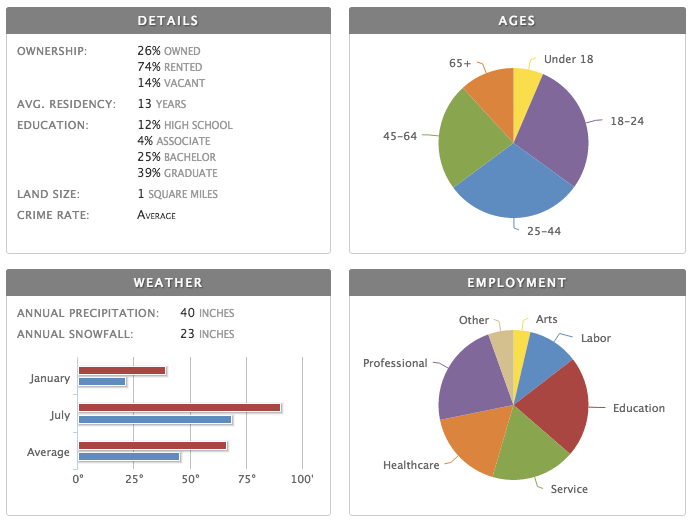 In 2015, there were 84 single family home and 146 condo sales listed by an agent. The vast majority of properties are historic, though there are also a number of condos available that are around 30 years ago. 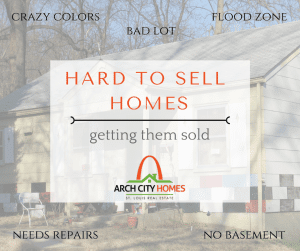 I specialize in selling St. Louis region homes regardless of whether they will be the hot listing to hit the market or if they have a challenge that makes it much harder to sell. 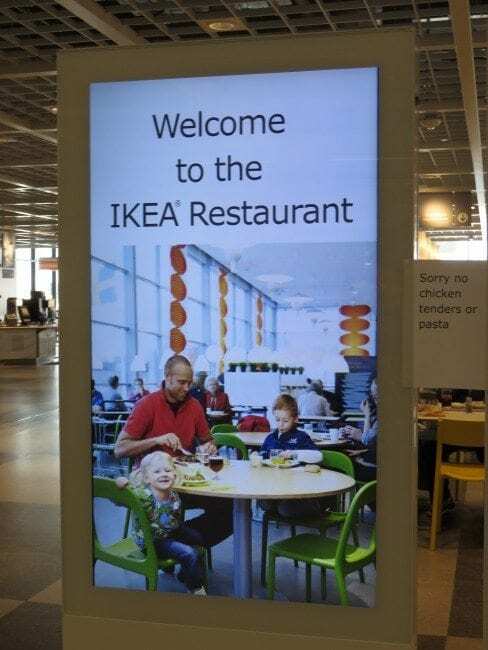 For years I’ve been hearing how people love IKEA. 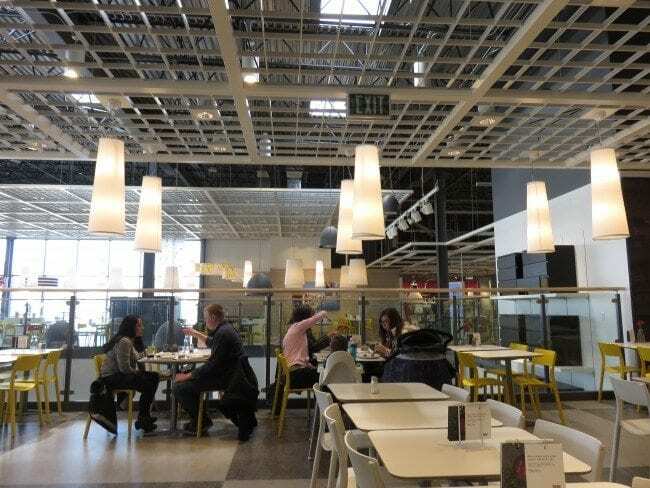 IKEA fans not only love the products, but love the experience of shopping in the store. 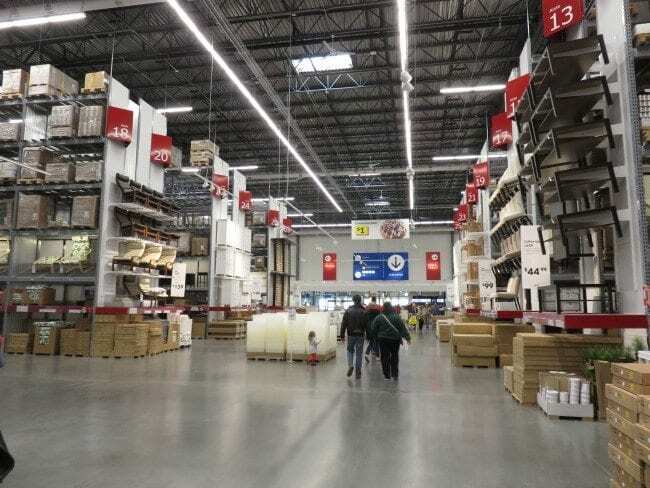 They love it so much, many of the St. Louis IKEA fans would drive to Chicago to go shopping. The owner of Circa Properties is one of those fans. Each time he opened a new office, he would make the 5 hour trip to Chicago to get everything he needed to furnish the office. 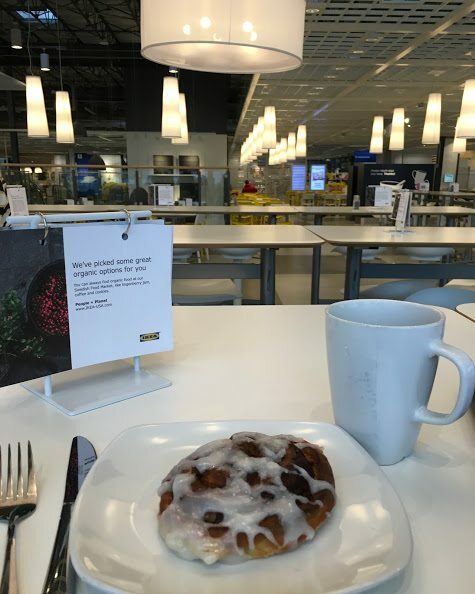 I was eager to check out IKEA when the store opened in St. Louis, but I waited a couple of months until the hype died down. I didn’t need anything in particular so I wasn’t about to stand in long lines just to do some window shopping. When I did make it to the store, I finally understood what the fans were raving about. 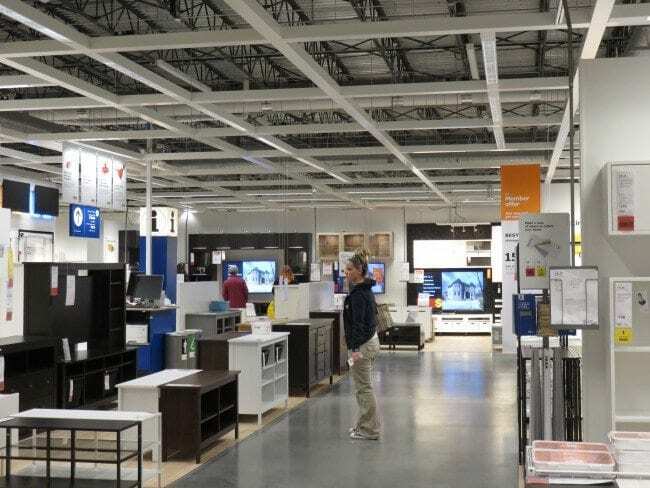 The experience of shopping in an IKEA store is a bit like visiting an Apple store. Everything has been engineered to make the experience enjoyable. 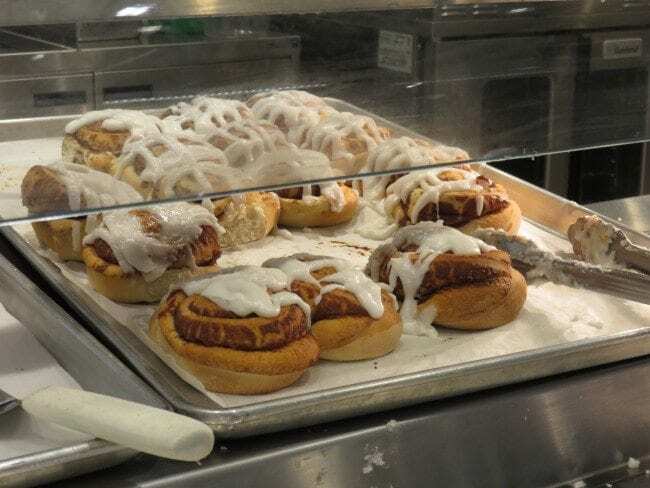 The moment you walk through the doors, you smell the cinnamon rolls that are available in the cafeteria during breakfast hours or at the take out food area by the checkouts. What a smart way to get shoppers into a good mood! The store is split into 2 levels. As you walk into the door, you are immediately directed to take the escalators upstairs. The store is setup like a maze with arrows directing you in the right direction. Smart move as it would be easy to get turned around without the arrows. 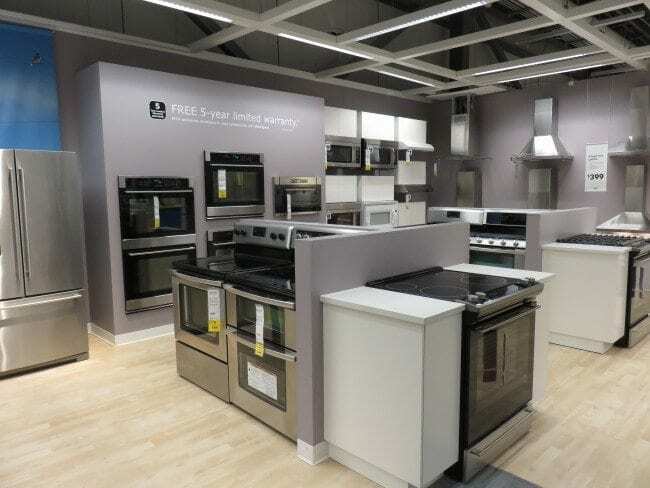 There are sections for every room of the house…kitchens, bedrooms, desks and even whole apartments. 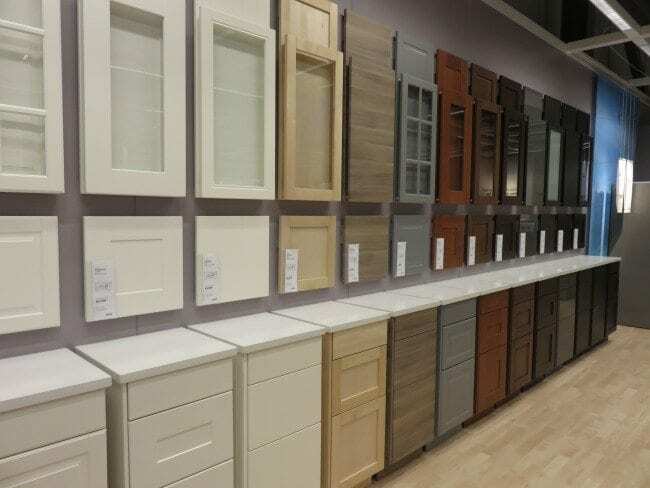 Every size and color is on display so it is easy to see what your options will be. 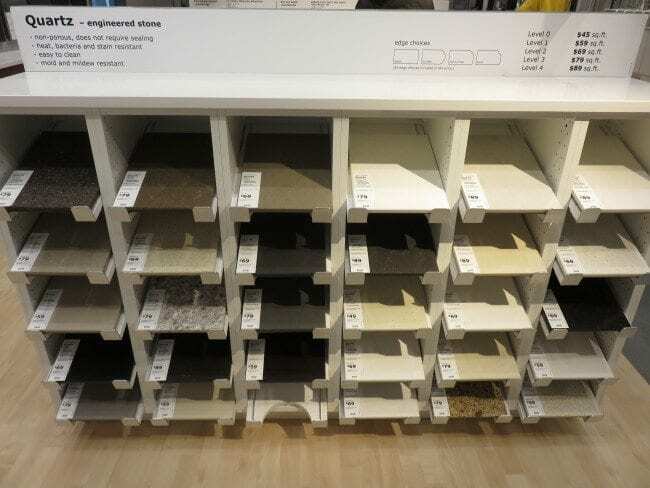 One of the things that IKEA does really well is showing you multiple ways to use the same product. 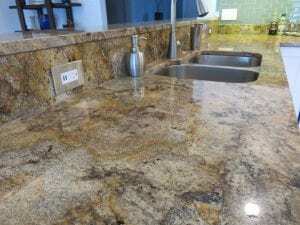 You’ll find the exact same shelves in the kitchens, laundry rooms and office designs. Rods that hold kitchen utensils via hooks also hold canisters for art supplies in kid’s rooms. While most of the inventory is very modern, there are pieces that would fit into just about any decor. 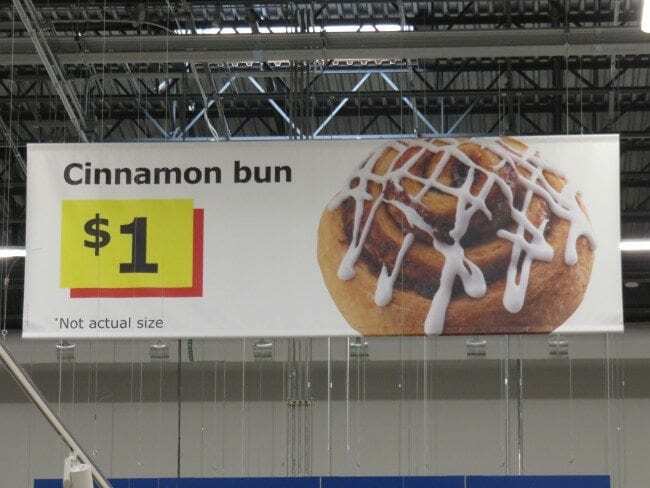 IKEA is also very affordable. 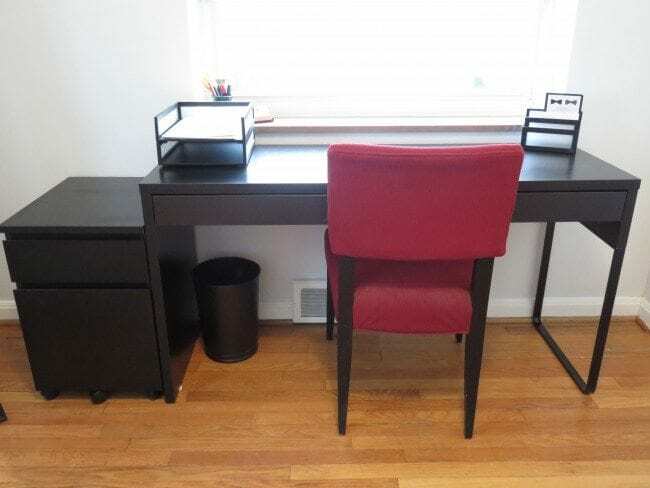 I just bought a desk at IKEA and it was less expensive as the ones I saw at Target. 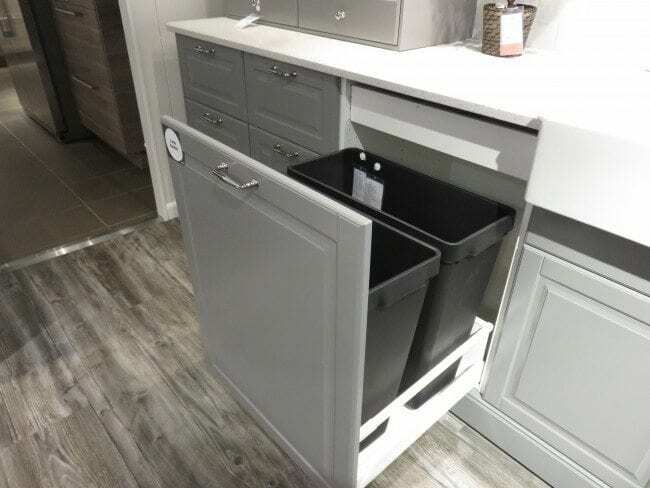 The desk and 2 drawer file cabinet above were just $79.99 each. As you walk around the store and find items you want to purchase, jot down the item location information on the pamphlets located throughout the store. 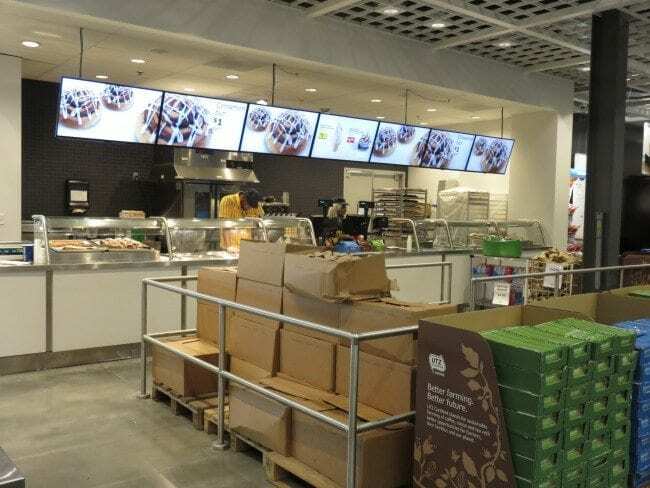 When you are finished, you head back downstairs and can explore another section of the store where most of the smaller items are located. You can load these items into a shopping bag or cart. If you are purchasing larger items, these can be found in the warehouse area you walk through to get to the checkouts. Everything is well organized so you can find your items easily. 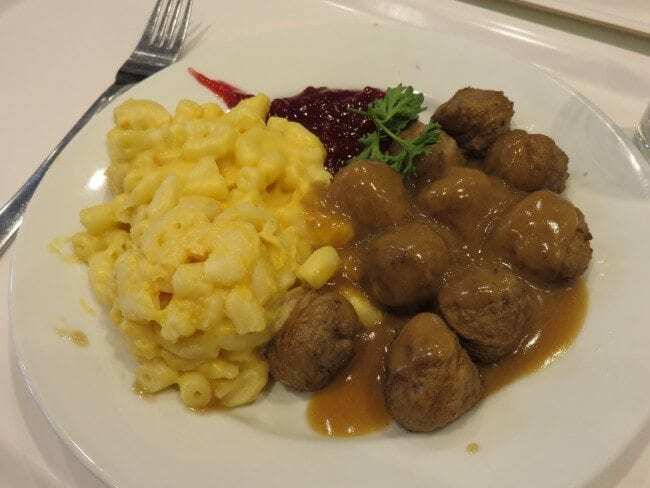 The famous swedish meatballs with mac & cheese…just $4.99. Takeout area just past the checkout registers. Cinnamon rolls in the morning, pizza later in the day. 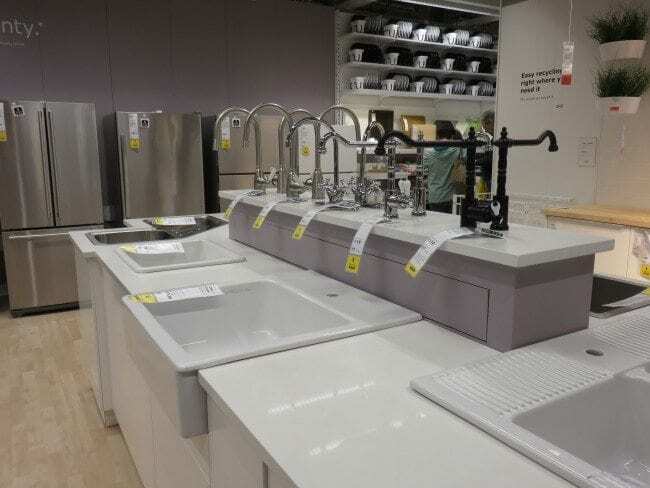 Design your kitchen at IKEA. 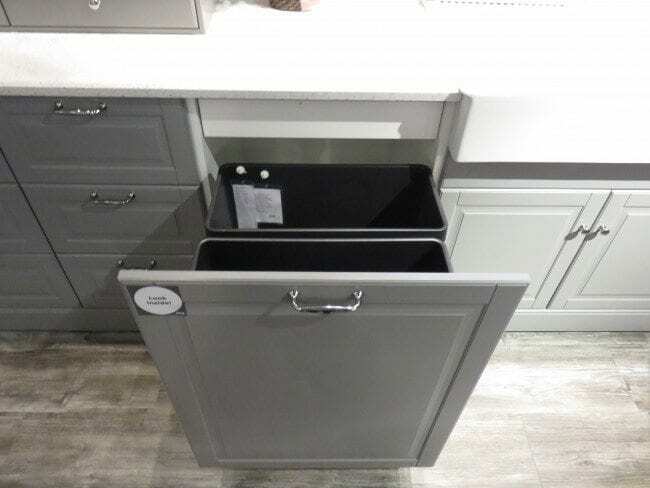 I’m buying this trash cabinet to go into my breakfast room nook. I’ll post the pictures when the project is finished. Bring your own bags – IKEA doesn’t supply any bags for small items, though you can purchase a large bag that will hold a ton for 99 cents. 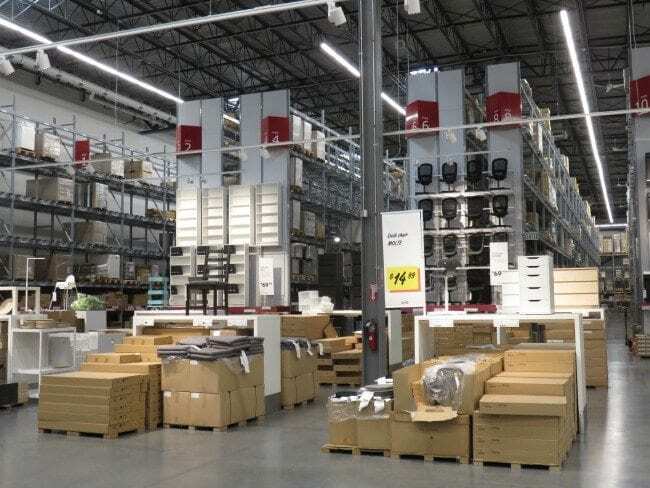 Assembly required – almost everything you buy at IKEA needs assembly. The instructions are pretty simple but they also offer assembly (and delivery) for an additional fee. 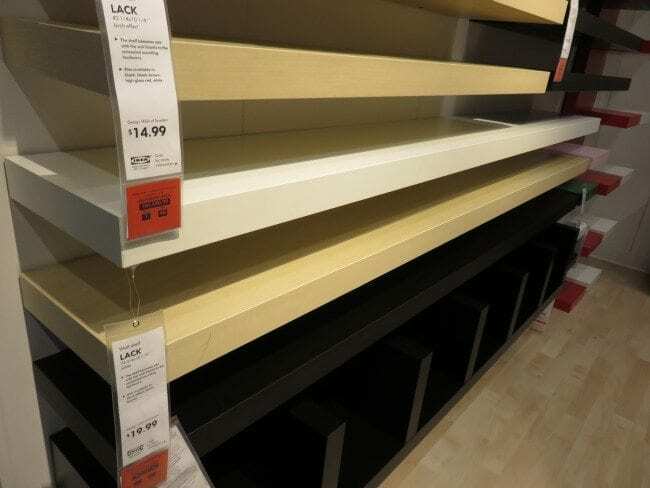 Shopping alone – don’t worry about not being able to manage the furniture by yourself, there are helpers stationed in the warehouse section and by the parking lot. 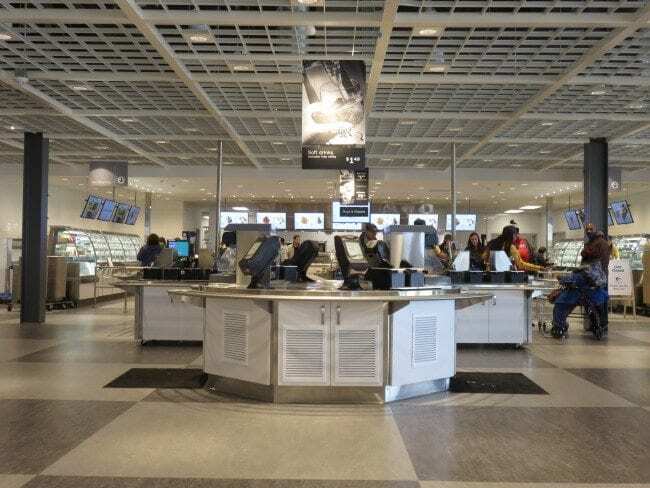 Wear comfortable shoes – the store is huge and it has concrete floors. Be prepared for a lot of walking. 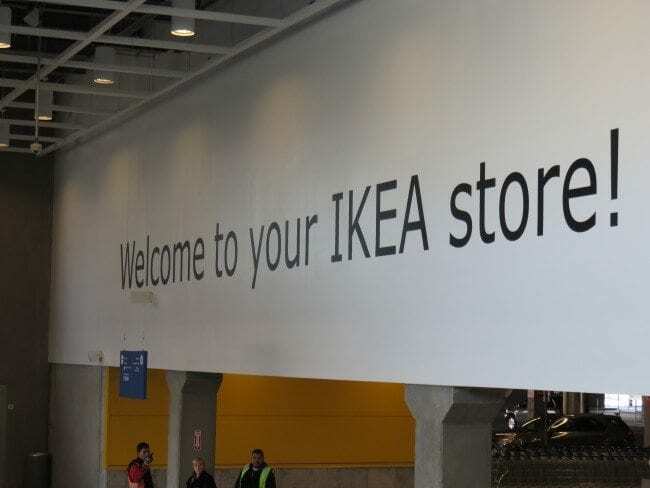 Read the signs – IKEA does a great job at helping you navigate the store if you just read the signs. Arrive early – the shopping area and kids zone (free babysitting) don’t open until 10 AM, but the cafeteria is open for breakfast at 9:30 AM. Coffee and tea is free if you arrive before 10 AM and there are breakfast options for $1-3. Dining with kids – the cafeteria has special carts that allow you to load up 3 trays on a single cart. I’ve never seen anything else like it but every food court should have them. Meet my foster dog Benny. He is totally blind and the sweetest dog you’ll every meet. Benny spent most of his life living with a hoarder. He was kept on a chain outside all of the time. It’s hard to imagine how hard this little boy’s life has been. If you are wondering why I’m writing about a foster dog on my real estate blog, it’s because everyone deserves a great home. Even a dog. Especially Benny. You’ll be seeing more dog rescue stories here on Arch City Homes in the future. I’ll also be sharing information dog owners need to keep in mind when they are thinking of buying or selling a home. You can find all dog related blog posts at the new Dog Lovers Corner. I’ve been fostering dogs for a few years now, and occasionally get a message from someone in the dog rescue network about a dog who needs a foster home. A while ago, I was asked if I could help with with a couple of small dogs from an animal hoarding situation. I already had a full house with a couple of foster dogs and had to say no. 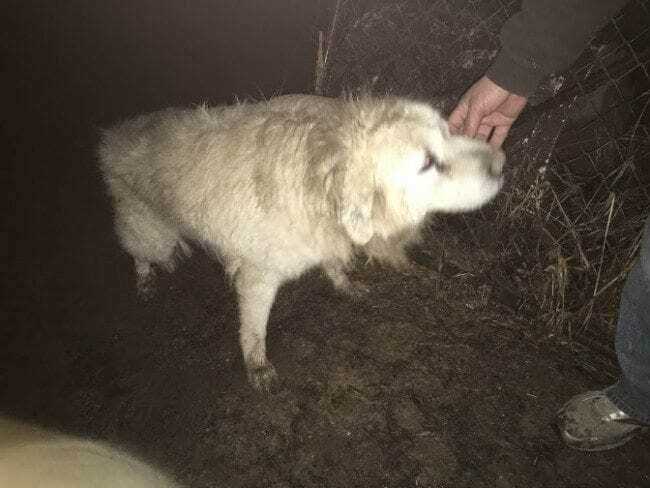 It sounded like other rescue groups stepped up and placements were found for a number of animals including dogs, birds and even a peacock. So I filed this one away in my head and moved on…there is always another rescue plea and it helps to stay focused on what you CAN do, rather than what you had to turn away. Faster forward a few months. All of my foster dogs had been adopted and I was ready for a new foster dog. I checked with St. Louis County Animal Control, but all of their small dogs had already been placed with other rescue groups. My next message was to Amanda with Stray Angels to see if she knew of any small dogs that needed a safe place to go. Within minutes she spoke to the relatives of the animal hoarder from a few months ago and found out they still had 2 small poodles. The week it rained and rained. 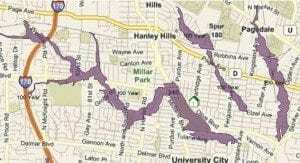 Highways and neighborhoods were flooded throughout the St. Louis region. I immediately imagined two tiny poodles huddling together, trying to stay warm as it rained for days on end. The relatives had moved the poodles, normally kept outside all of the time, into a stairwell landing between the kitchen, side door and basement. While the dogs were out of the rain, they still weren’t in a warm dry house. I couldn’t leave them out there even one more night so I jumped in the car and drove in the dark from my home in Webster Groves to Millstadt, IL. The owner had been hospitalized and her kids met me at the house. They clearly wanted a better life for the dogs. To my horror, I realized there were other animals at the house that I would be leaving behind when I left. I got as much information as I could about the one dog still outside on a chain and the 2 cats that had spent their entire lives locked in a small bathroom, and then loaded up Benny and Snoopy into my car. Thumper was so matted that his collar had to be cut off. He had been living with a heavy chain around his neck for so long that he walked with his head just inches above the ground. This cat was the friendly one. 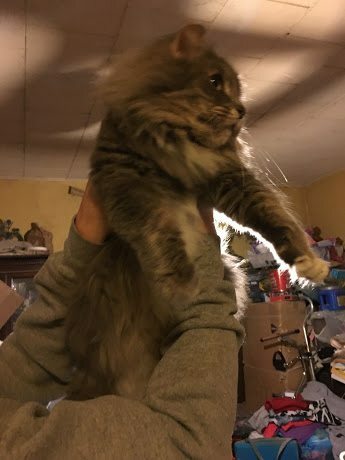 The other cat was supposedly semi-feral and the relatives planned to let it loose outside with hopes it would find its way to the other cats that lived on their own in the woods. It turns out, the semi-feral cat had a claw that was growing into its paw. I would be wild too if I was living in pain all of the time! The story has a happy ending. I immediately let Amanda know about the remaining animals and within 3 days they were all taken from the home and placed in foster care. Just two weeks later, Snoopy went to his forever home. He now has a devoted mom and two poodle brothers. The vet is guessing Benny is roughly 10 years old. He is blind and has a little cough we were working on, but is otherwise in good health. Help me find Benny a forever home. All you have to do is share this blog post so people can see his video. 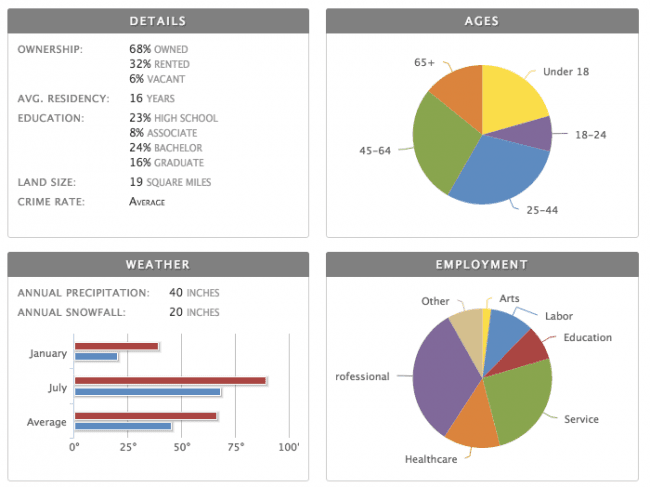 I’m looking for a home in the St. Louis area with someone who is retired or home most of the time. He gets along with dogs just fine, and I’m positive he would simply ignore cats. He loves people of all kinds, but due to his blindness, I’m looking for a quiet home without children. All he really needs is someone who wants a furry baby for company. A home where he can be coddled and carried around from one part of the house to the other. He isn’t fully house trained, but as long as you take him outside on a regular basis and crate him when you aren’t home, he rarely has an accident in the house. UPDATE: It only took 2 weeks to get Benny house trained. He can’t tell you when he needs to go out, but if you put him on a schedule, he will hold it until his feet touch grass. Benny doesn’t need a lot of outside space, but he does need a fenced yard. It actually doesn’t need to be a real fence. A small area with a garden picket fence would be fine. He won’t try to break out of the yard. He just needs to know where the boundaries are and have a safe place to get a little exercise and enjoy a warm spring day. If you are interested in adopting Benny, please contact me or go to Senior Dogs 4 Seniors and fill out an application. Donations to help cover his vet care are also appreciated. In 2015, Senior Dogs 4 Seniors spent over $90,000 on vet bills! 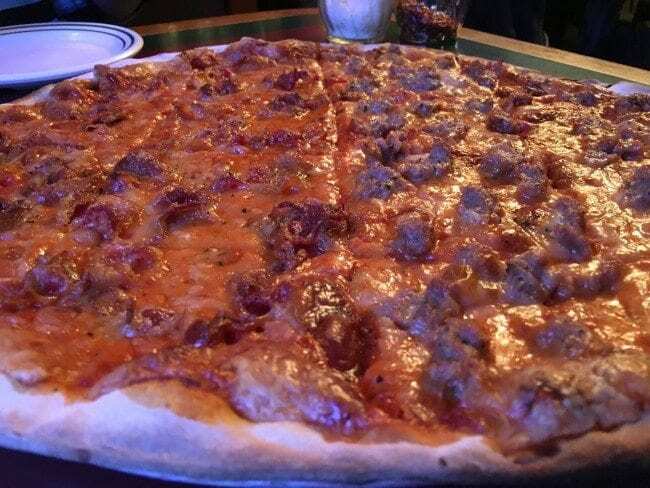 As I continue my Exploring St. Louis One Meal at a Time series, today I’m sharing one of my new favorite pizza places, Serra’s Pizzeria in Maryland Heights. 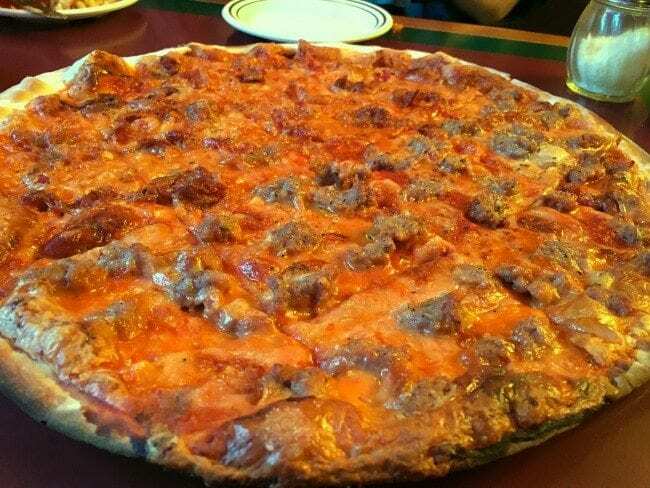 I actually ate at Serra’s Pizzeria for the first time about 10 years ago. 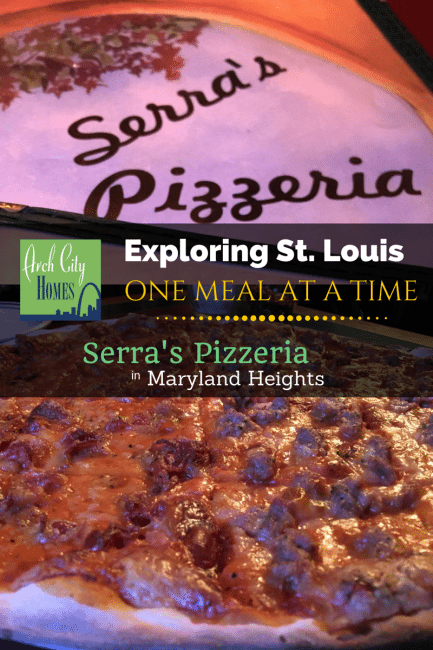 My boyfriend at the time lived in Maryland Heights and he loved Serra’s. Serra’s Pizzeria is not going to impress you with the decor. They probably haven’t redecorated since the place opened in 1970. 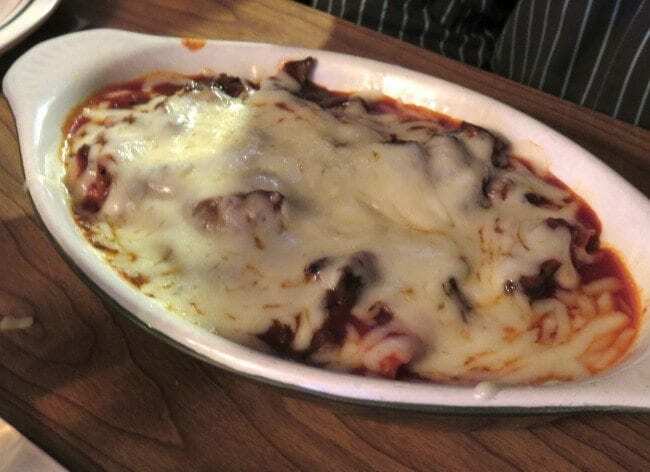 But if you are looking for an unpretentious atmosphere with friendly staff and great food, you should give Serra’s a try. I recently went to dinner with some social media friends, snapped this picture that gives you a feel for what you will find when you walk through the door. 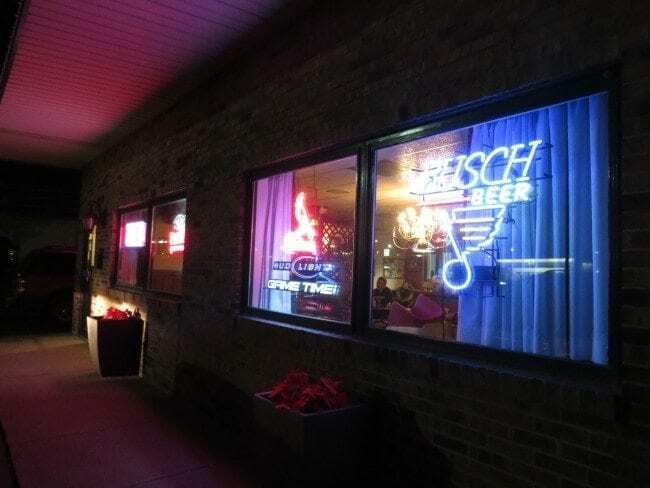 As the signs indicate, this is an Anheuser Busch type of place. You aren’t going to find craft beers when you visit Serra’s. They do have a well stocked bar though if you would rather go with a cocktail. Serra’a is a family owned business too. My favorite kind of place. 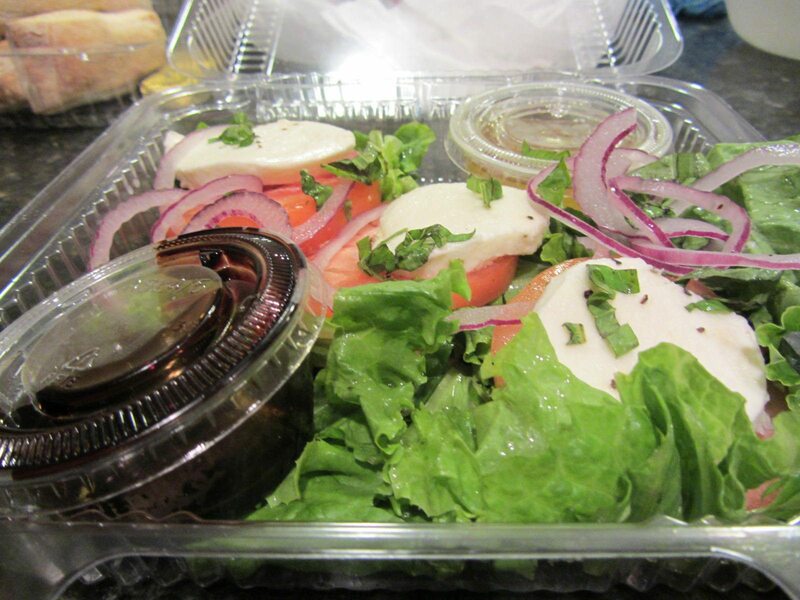 Serra’s menu includes appetizers, salads, sandwiches, pasta and entrees. 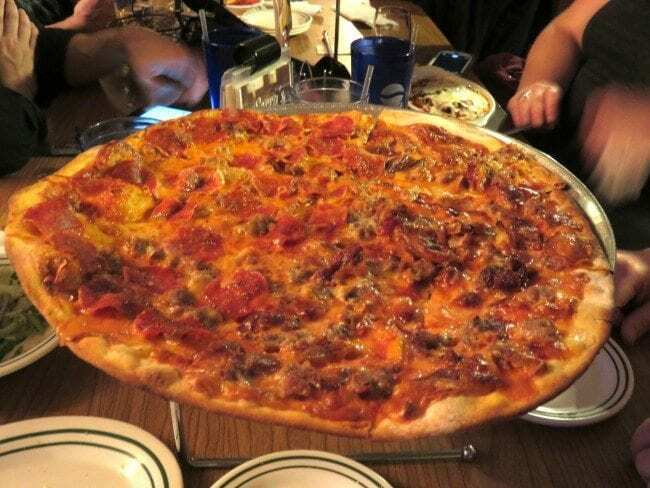 But Serra’s specialty is their St. Louis style thin crust pizza topped with provel cheese. A couple of months ago as I was getting ready to list a new condo just a block away, the owner and I headed to dinner after one of my visits. And of course we went to Serra’s. 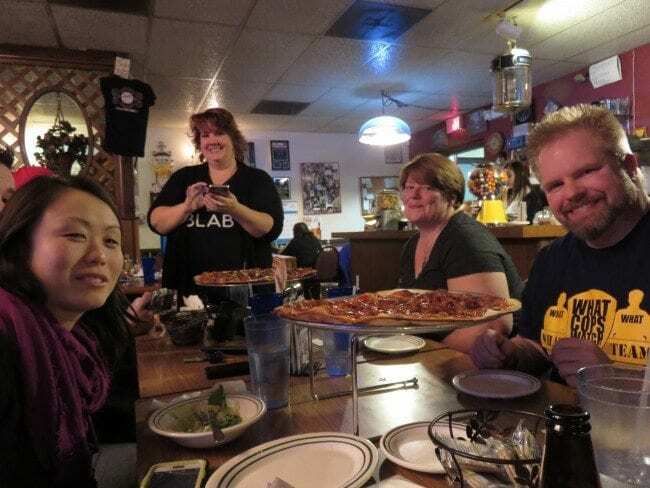 I was so floored by the pizza with its crisp thin crust and house made bacon and Italian sausage toppings that I have been back twice in the last month to introduce friends to Serra’s. 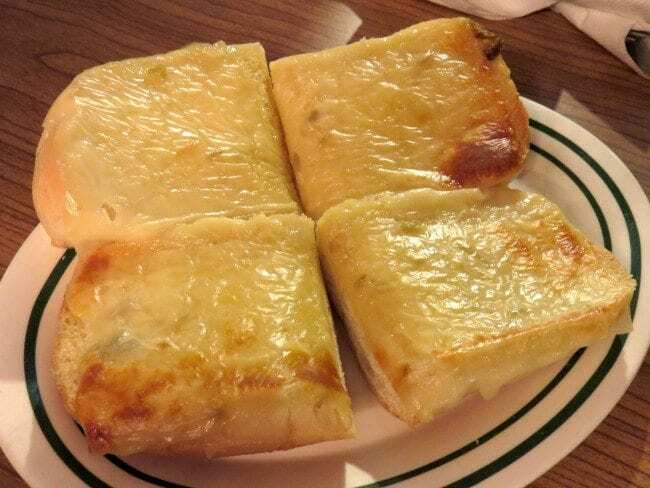 On one of my visits, I ordered some cheese garlic bread…which I normally love. I think it was just ok here and probably would opt for something else on my next visit. 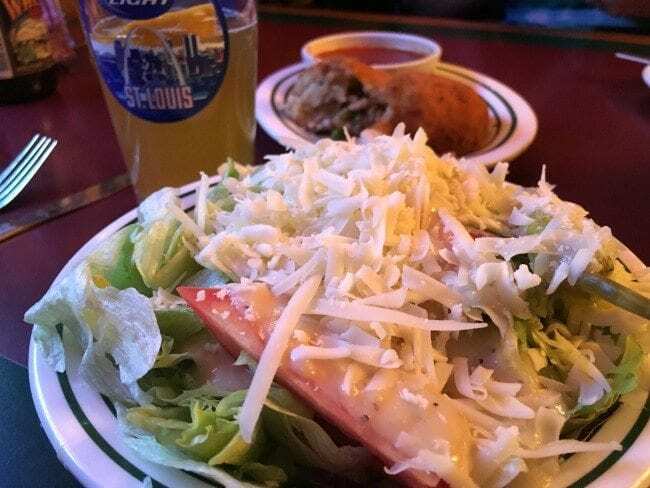 I also ordered a salad on one of my visits. Again, it was ok, but nothing to write home about. However, the arancini, a stuffed rice ball appetizer was a definite winner. 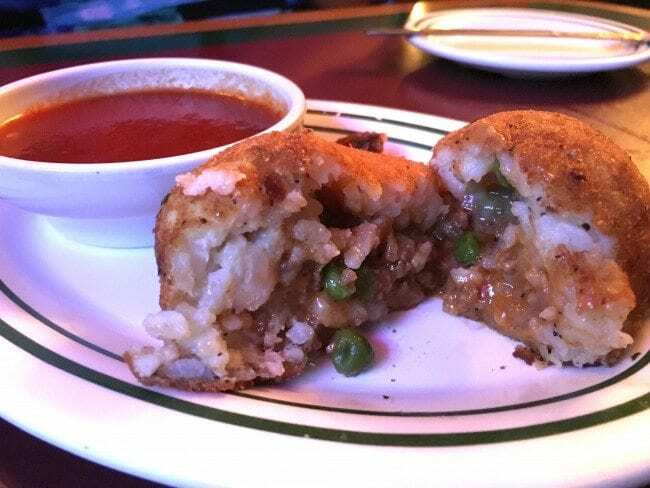 It is stuffed with meat sauce, peas and cheese, then rolled in bread crumbs and deep fried. I also snapped a picture of the pasta with mushroom sauce, ordered by my friend Janice. I didn’t taste it but she said it was spectacular. 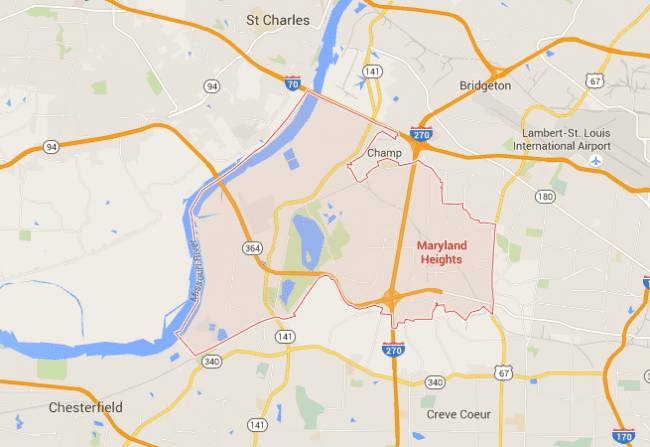 Maryland Heights is a great place to buy a home in St. Louis region. Maryland Heights is served by the Pattonville School District and the Parkway School District, one of the best public school districts in the county. 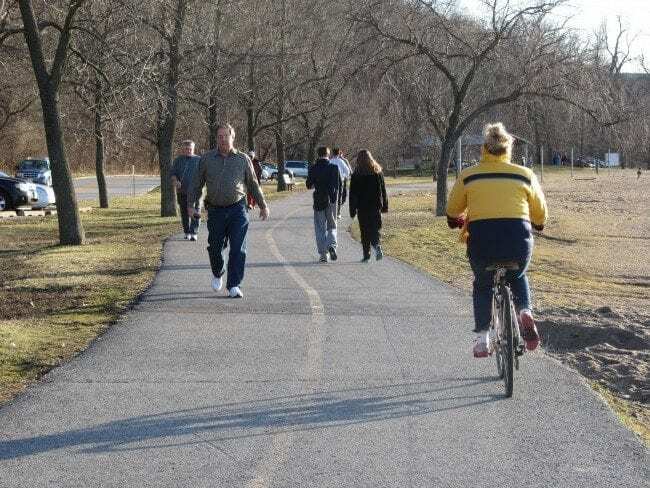 The city has a number of recreational amenities including a Community Center which offers a fitness center, courtyard and auditorium available for events. A new Community Center is under construction now and will have expanded services. 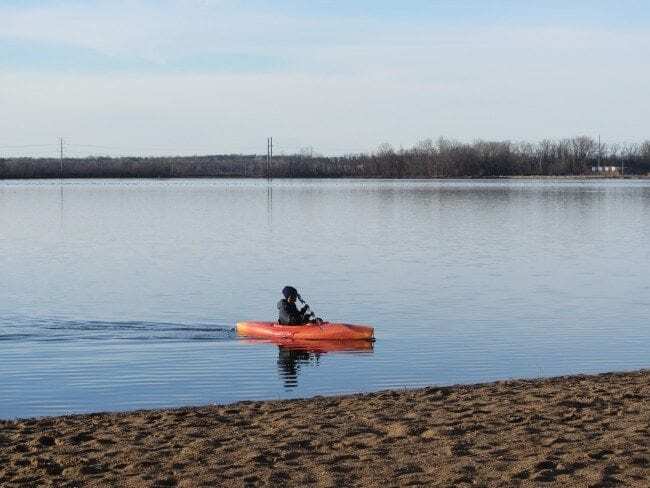 The city also has a summer Aquaport and a dog park. 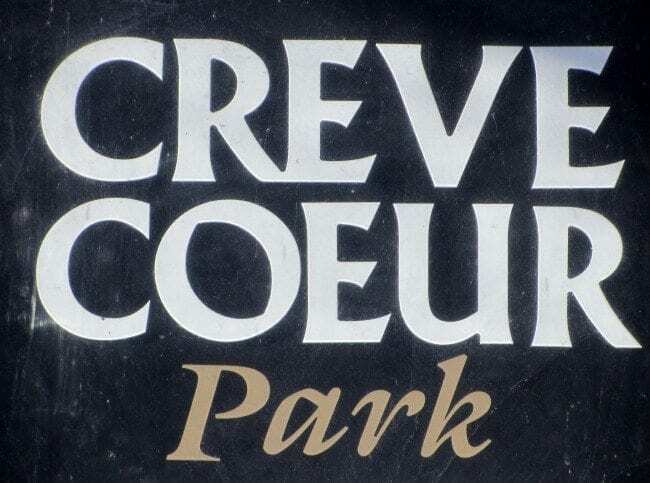 The city is also home to 7 parks, including Creve Coeur Park, one of the most popular parks in town. 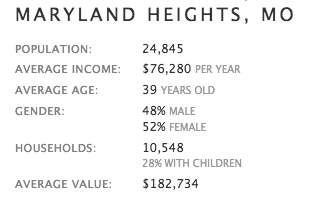 You get a lot of home for your money in most portions of Maryland Heights, and it’s easy to find an affordable home. 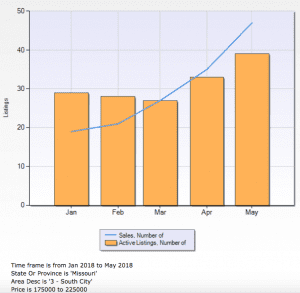 In 2015, there were 358 home and condo sales listed by an agent. 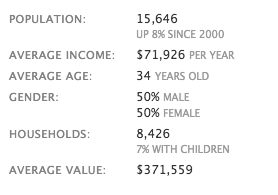 The vast majority of homes are 30-55 years old, built in the 1960s to 1980s. 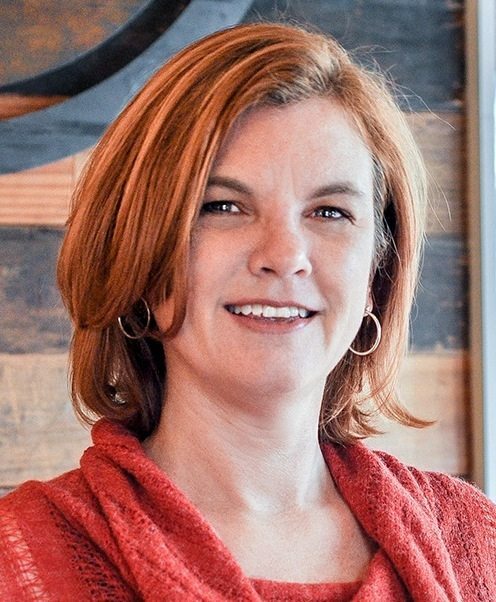 This week in our weekly St. Louis Blab video chat series, Robyn Wright and I lead a discussion of our favorite places to go on a day trip or weekend road trip from St. Louis. Giving Tuesday – What’s Your Favorite Charity? Be sure to join us every Tuesday at 8:30 PM Central time for our weekly #STLBlab. To get notified when our video chats go live, follow me on Blab.